The UK Government is increasing the level of devolved authority for the provision of rail services serving population centres in England. The larger City regions have had Integrated Transport Authorities made up of representatives from elected Local Authorities and separate Executives in various forms since the 1968 Transport Act and the Government elected in 2015 has decided to strengthen the role of these organisations. They will cover a wider range of transport planning activity services with a greater say in the specification for franchised operations, promotion of light rail systems, and road use issues. As a result local authorities have formed the Urban Transport Group which will absorb the earlier Passenger Transport Executive Group and now include Transport for London (TfL) in its membership. Outside London the move towards Combined Authorities is reflected and the organisations making up the UTG are Transport for Greater Manchester, the West Yorkshire Combined Authority, Merseytravel, Centro (which covers the West Midlands), the North East Combined Authority, and South Yorkshire Passenger Transport Executive. Nottingham City Council and the Strathclyde Partnership for Transport will be associate members along with the West of England Local Authorities which are to be given devolved powers for the provision of public transport services in Devon and Cornwall. The change is part of Government policy to move decision making nearer to users under the control of elected Mayors such as in London and local authorities rather than centralised direction. 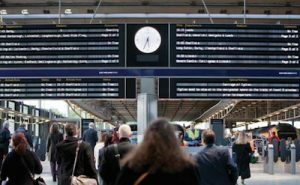 In London it is proposed to establish a partnership between the Department for Transport and TfL to provide strategic direction for the specification and management of rail passenger services across London and the South East. This proposal includes the transfer of responsibility for inner suburban rail services that operate mostly or whollywithin Greater London, as current franchises fall due for renewal. It is the intention that this will cover routes within Greater London but the service pattern will require extension beyond the boundary into the adjacent counties of Kent, Surrey, and Hertfordshire. The timescale is that some Southeastern routes will transfer at the end of the current franchise in 2018 with similar arrangements for Thameslink, Southern, and Great Northern routes when that contract expires in 2021. For South West Trains the future franchised operator will asked to identify services that could be transferred in 2020. The DfT will continue to be responsible for longer distance outer suburban services. There is little dispute that the London Overground business model has been a huge success with improvement to all key performance indicators. These formerly rundown services have been transformed by setting a tight specification for the provision of train services using new rolling stock and the staffing and upkeep of stations. Passenger numbers have increased 4-fold since 2007. The Department for Transport, London Mayor, and Transport for London have invited interested parties to respond to a consultation process by 18 March 2016.